In preparation for the upcoming forecast’s International section and based on some recent conversations with our advisors, I have updated the full slate of our export graphs including adjusting for price changes. What follows is a brief excerpt of these graphs, however for the complete set of graphs and slides in PDF please follow the link at the bottom of the post. The first two sets of graphs below are our standard ones that show Oregon exports in current dollar value. 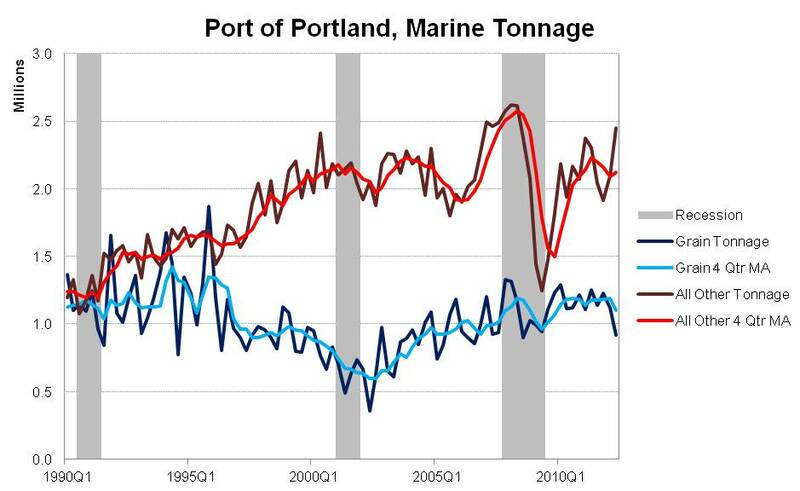 After rebounding strongly following the depths of the recession, Oregon’s exports have moved in fits and starts over the past three years, however the trend is fairly steady. However that masks the diverging trends within the industries. Computer and Electronic Products – by far our largest export industry – have been generally declining following their run up in late 2009 and early 2010, however all other industries have seen more growth in recent years. As Computer and Electronic Products have slowed, our exports to China and Malaysia have likewise seen declines given that this industry represents the vast majority of exports to these countries. Exports to Canada continue to rebound and are just below the all time high in nominal value. Finally, an update two years in the making, the following graphs take a look at inflation adjusted export values. The most commonly reported statistics on exports are the current (nominal) value, similar to the first set of graphs, however as commodity prices move so too does the value of the exports, even if the quantities themselves remain the same. Unfortunately price level data is not available for all industries, however it is for approximately 78% of Oregon’s exports so the following graphs represent this portion of Oregon’s total exports. Overall Oregon’s price adjusted and current dollar exports are similar, however this masks the underlying industry trends. The state’s largest export industry – high tech, although most of these are technically classified in Electronic Machinery* – has experienced actual price declines over time as the power of computing keeps on increasing, which is different than most other industries where prices continue to rise. 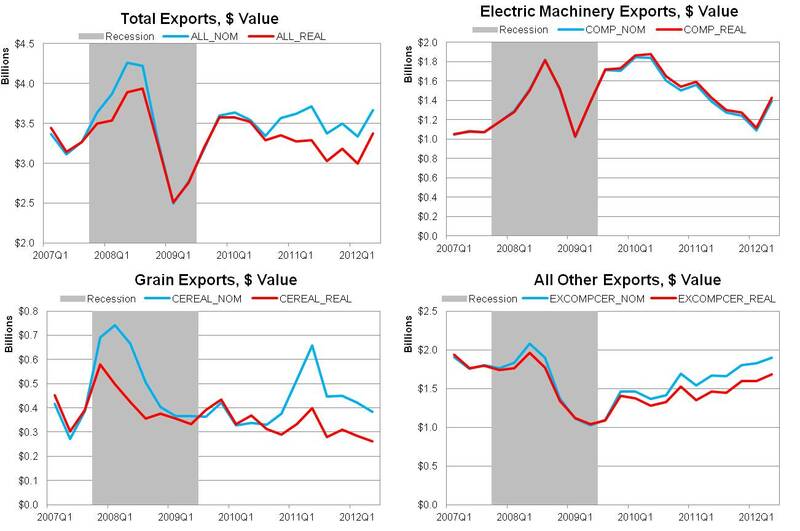 Once the price of grains are taken into account, Oregon’s exports in this category are much less volatile than their nominal dollar values suggest. All other industries’ exports follow a more typical path – a rising real value of exports where the underlying increases are larger than just the rising prices – and continue to expand since 2009. * The Harmonized System Code 85 – Electronic Machinery – contains both HS 8542, Electronic Integrated Circuits & Microassembly Parts, and HS 8541, Semiconductor Devices and Light-Emit Diodes Parts.